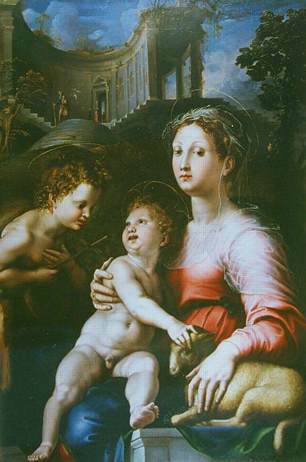 The Madonna and Child with Saint John the Baptist. Giulio Romano and workshop. Copyright ©1999. The Walters Art Gallery, Baltimore, Maryland. The only direct reference Shakespeare makes to a Renaissance artist is in The Winter's Tale, where the statue of Queen Hermione is said to have been made by "that rare Italian master, Julio Romano" (5.2.99). The feature of Romano's style that is emphasized in the "statue" scene is the remarkable realism of the painting. Romano*, at first an assistant to Raphael, developed a style that achieved realism by the use of visual illusion. It was a style more dramatic and exaggerated -- more "mannered"-- than that of his master. Julio (Giulio) Romano began a fashion which several later painters followed. Mannerism is characterized by paintings of strong emotion and drama, often deliberately flouting the rules of classical restraint and decorum. In some ways later Jacobean drama*, and The Winter's Tale* itself, can be seen as analagous to the Mannerist style. In this example of his work, the young John the Baptist leans towards the Christ child holding a small cross in his hand, while both Mary and Christ reach out to touch the equally symbolic lamb. This traditional subject is heightened by the picturesque ruin of a building in the background -- a building which, while ruined, is clearly in the high Renaissance style of Romano's time, exotically curved, and reached by elaborate stairways.The glimpses of nature in the sky and tree are equally realistic. There is no way of knowing whether Shakespeare had actually seen any of Romano's works, but it is clear that he was familiar with his reputation. The plays of John Webster and Thomas Middleton in particular can be seen as Mannerist in their exploration of extreme characters and situations. A tale for a winter's night. . .
A winter's tale is one that is told by the fire on long winter evenings, and it is allowed to break all the rules--which Shakespeare's play certainly seems to do. There is a sea-coast on land-locked Bohemia, the play switches abruptly from tragic to comic modes, scenes change widely, and time passes quickly, all in contravention of the neo-classical "unities" of time and place. Even the unity of action seems to be violated by the stage time given the rogue Autolycus, who never actually influences the plot in any significant way. In a similarly Mannerist fashion, the jealous, passionate emotions of Leontes in particular seem out of proportion to the stimulus that evokes them.